All the News Fit to Wear! 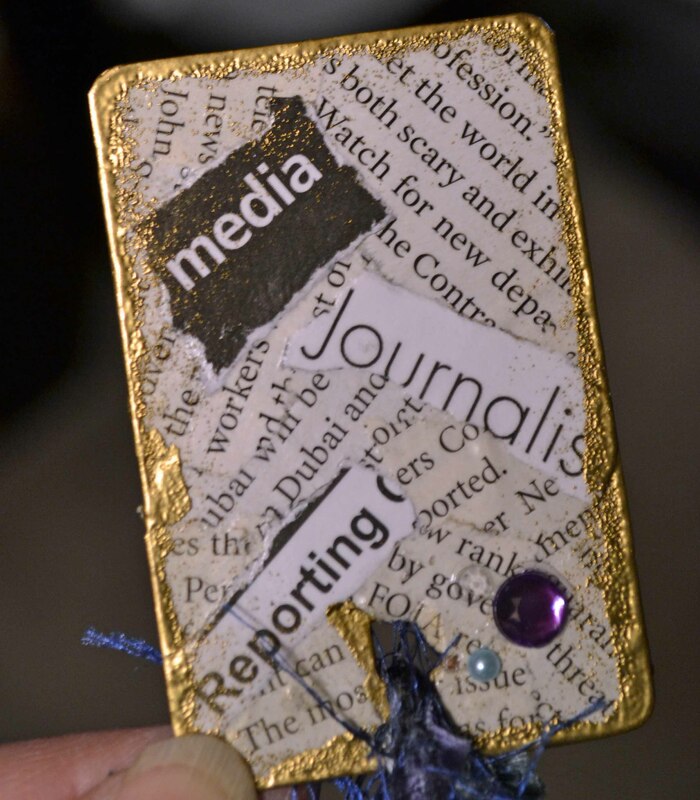 When my friend and former news reporter colleague had a birthday, she requested hand made gifts only. Brilliant! Right up my alley! 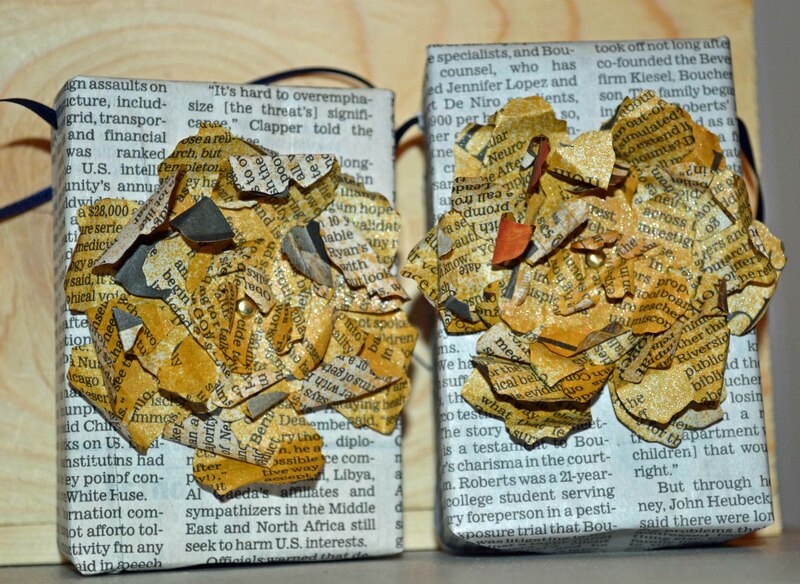 I used a Formica chip left over from a long-ago remodeling project and collaged pieces of newspaper. I gold embossed the edges and added some pretty yarns, bling and a pin back. 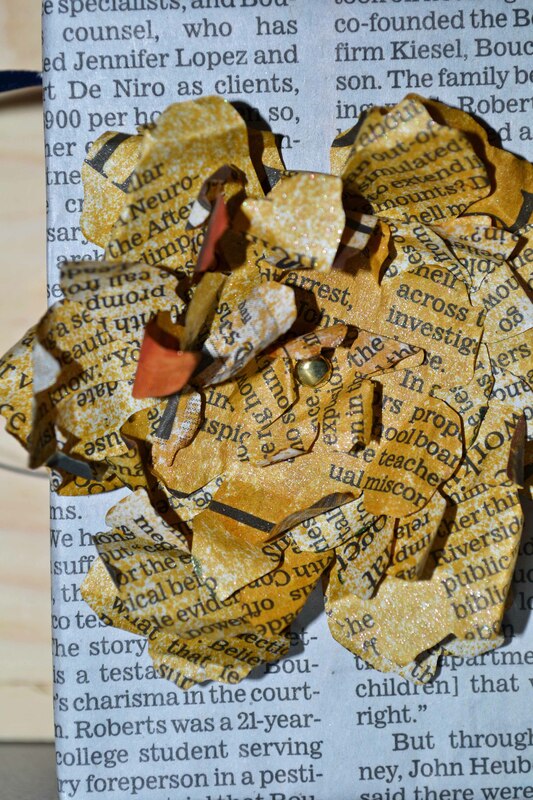 After collaging the box, I sprayed on some gold Perfect Pearls for a little sheen. 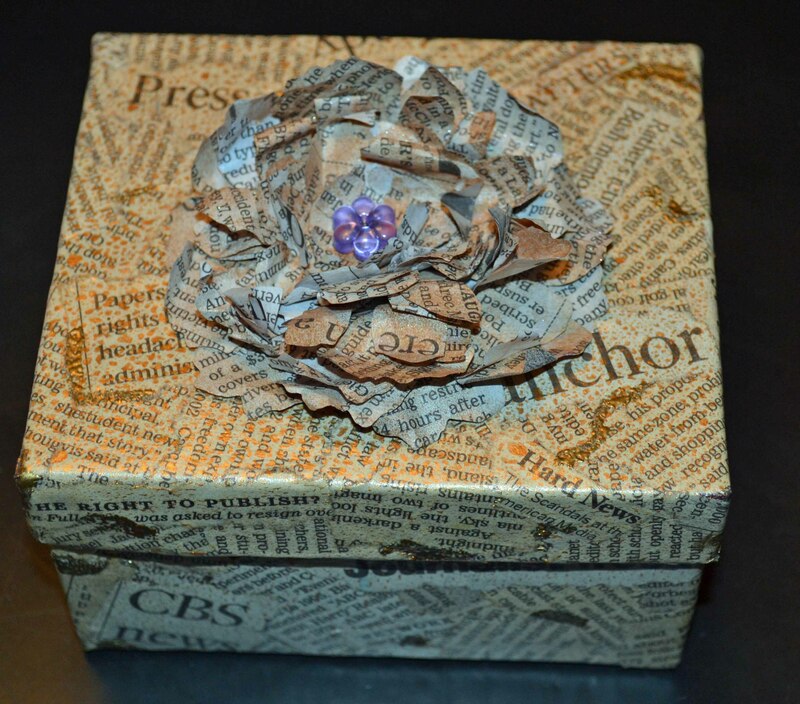 I added a flower topper made from … that’s right … newspaper, which I cut using a Tim Holtz flower die. So easy and effective! Are you as addicted to Pinterest as I am? 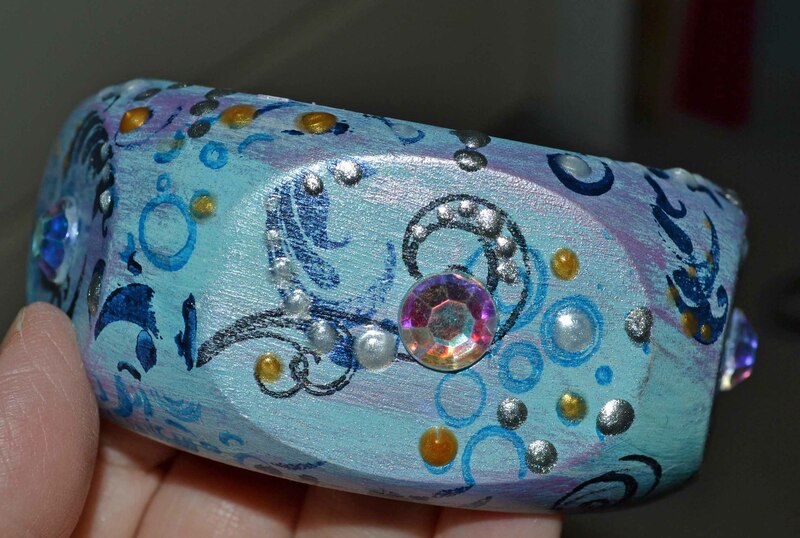 Come back Friday for a Fabulous Find … and a giveaway! This project was a departure for me, but I had a lot of fun making it, to give to a co-worker. I used several different products to make this bracelet. 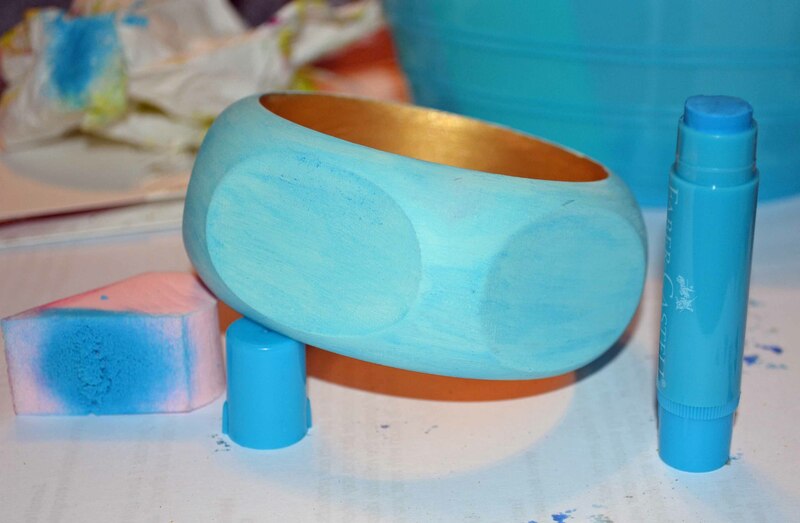 I first primed the bangle (which I got a looong time ago from DIYBangles.com) with white acrylic paint on the outside and gold on the inside. When it was dry, I rubbed it with a blue Faber-Castell Gelato. I don’t know if I needed to heat set it, but I did. It was hard to stop. Thanks for coming by! 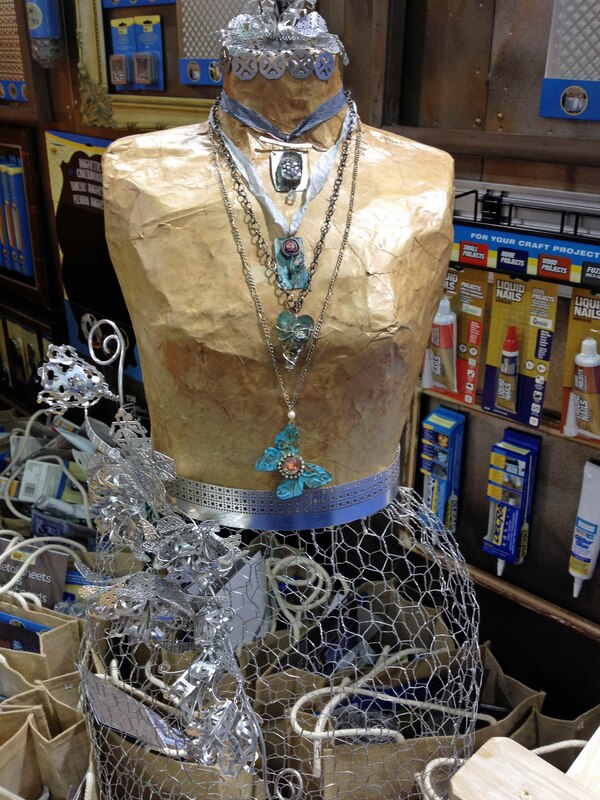 One of the coolest things I did was take a workshop with Susan Lenart Kazmer of ICE Resin. 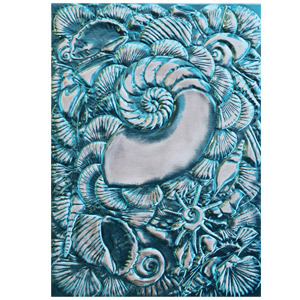 This product has been around for a few years and I have long admired the gorgeous jewelry and resin paper made with this product. (Check out the website for great inspiration). But I have been too chicken to try it. It seemed so complicated. Guess what? It’s easy!!! And so much fun I am now addicted. I want to resin everything! They’re not perfect, but not bad for my first attempt. 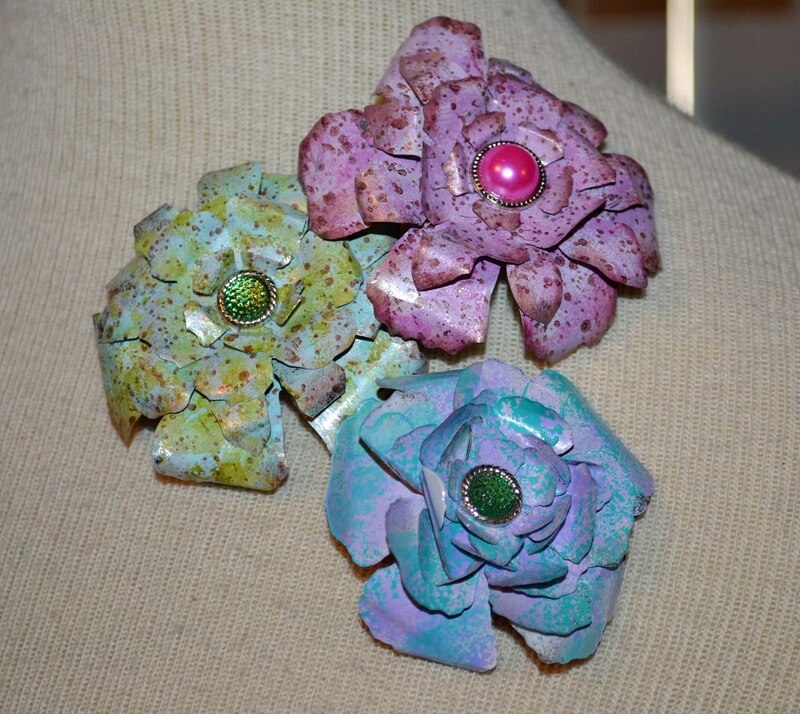 I am crazy about making resin paper (LOVE the translucent look) — wish I had known a year ago how easy it was! 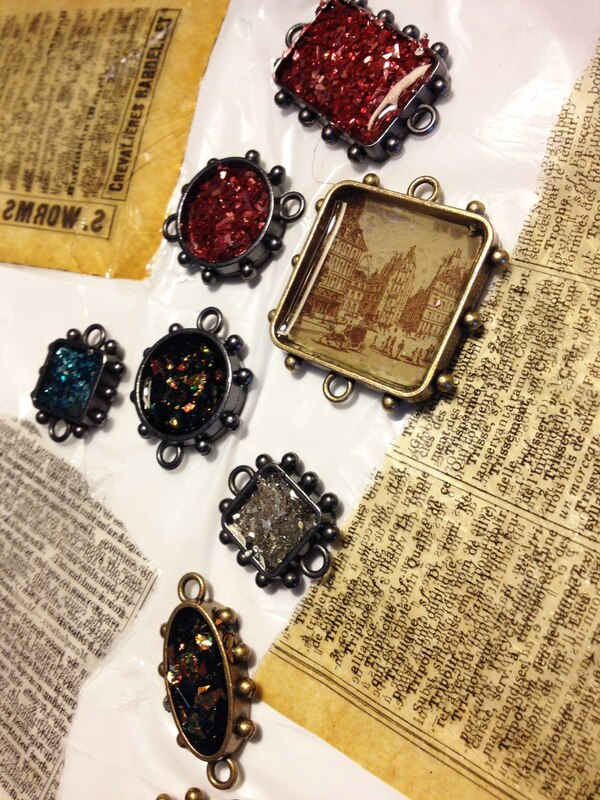 I also tried the Iced Enamels, but I can’t find the piece I made. But you know I’ll make more. 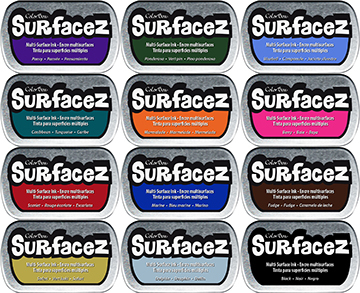 This fast-drying, permanent ink works on many surfaces, including metal, plastic, wood, glossy cardstock, etc., and comes in 12 colors. First, I washed some empty soda cans, then carefully cut them open using a kitchen scissor. Be careful as some of the edges and points are sharp (ouch — don’t ask how I know this!). 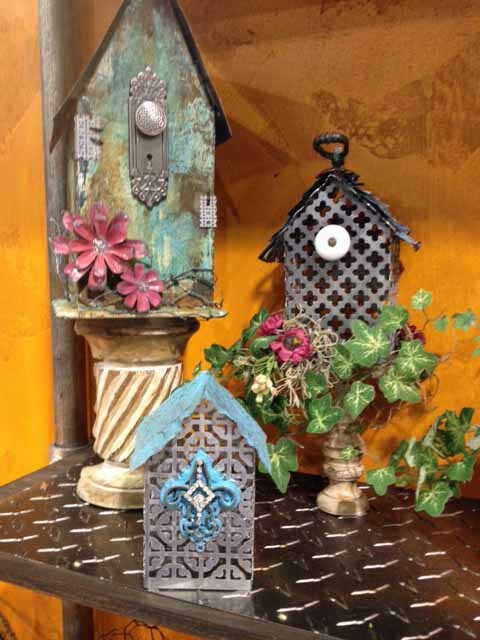 I cut the cans into smaller pieces, taped them onto my Tim Holtz/Sizzix Tattered Flower die and ran them through my Big Shot die cutter. 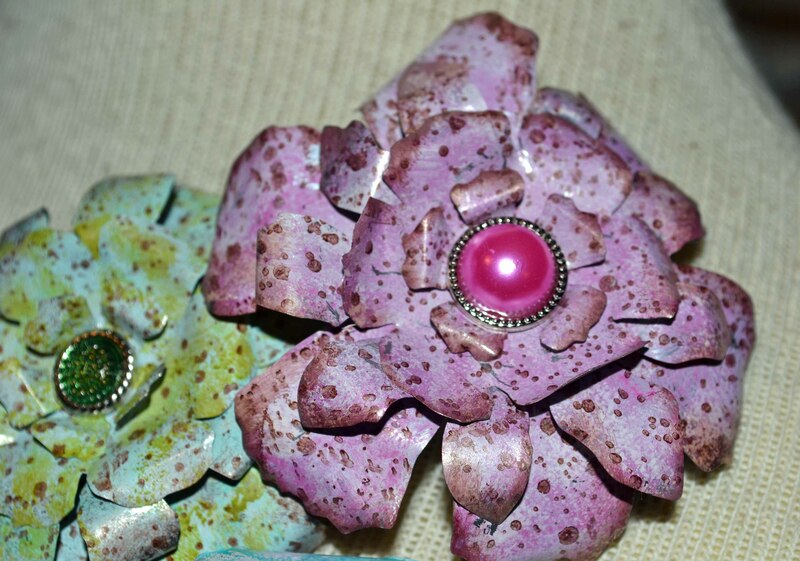 You may need two soda cans to make all the petals. 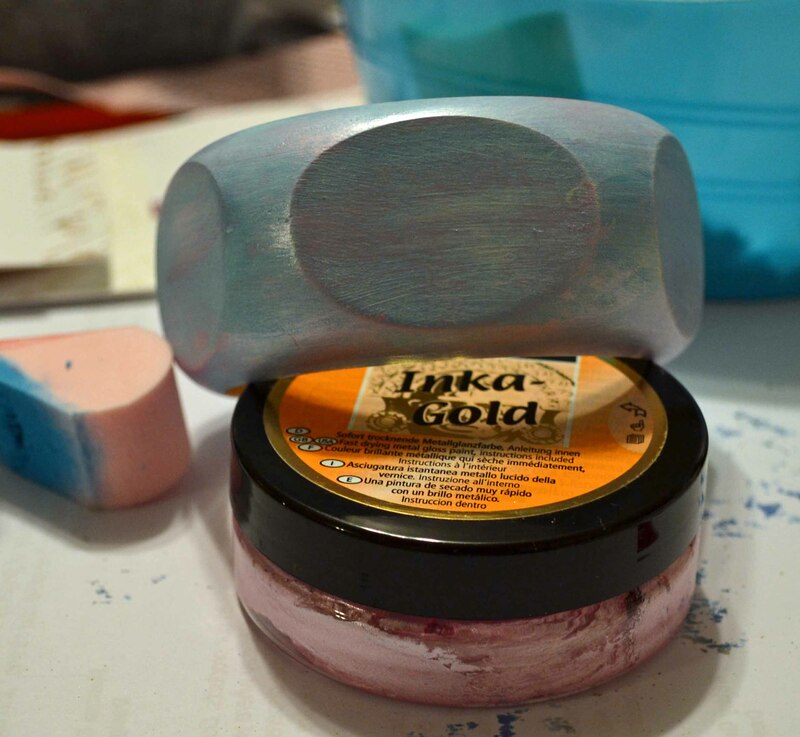 I used Vintaj Patina paints and a sponge to dab color onto the pieces, then punched holes in the center using my Crop-a-dile. 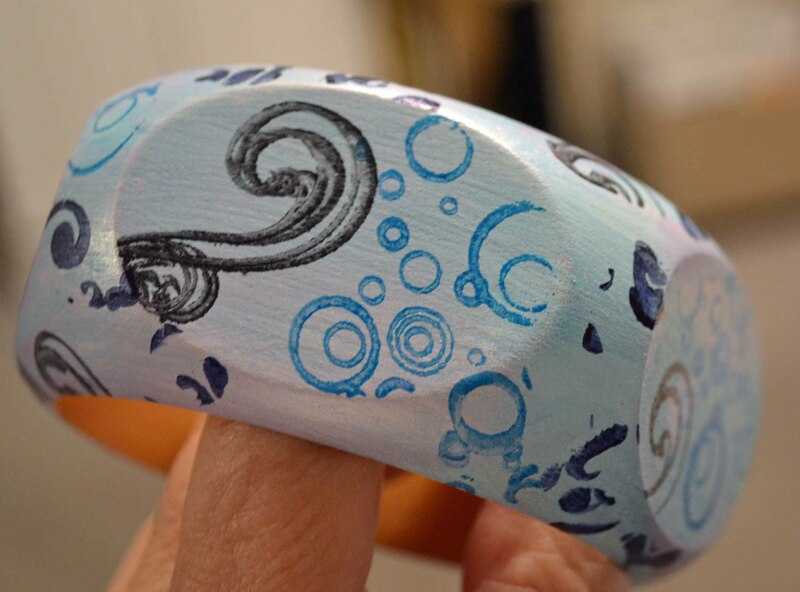 The Vintaj paint dries very quickly. Using the Fudge Brown SurfaceZ ink and an old Hero Arts background stamp (sorry, I don’t have the number), I stamped the patterned dots randomly over the petals. (Yes, I know, the blue one does not have any texture. It was my first.) I also edged the petals with the brown SurfaceZ ink. Starting with the smallest flower, stack them on a big glitzy brad (Eyelet Outlet), turning them so the petals are randomly spaced. Close the brad, then carefully bend and shape the petals (I used my fingers to shape the petals) so they form a dimensional flower. Glue a pin to the back (I used E-6000) and wear with pride! 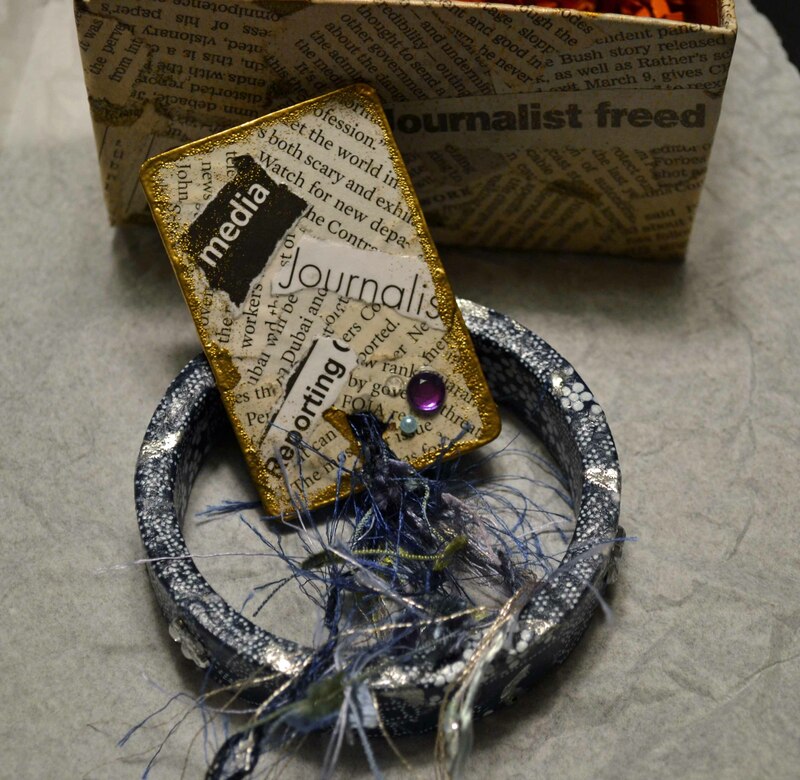 Earlier this year I made two jewelry pieces to be donated to a journalism group for a fundraising event. 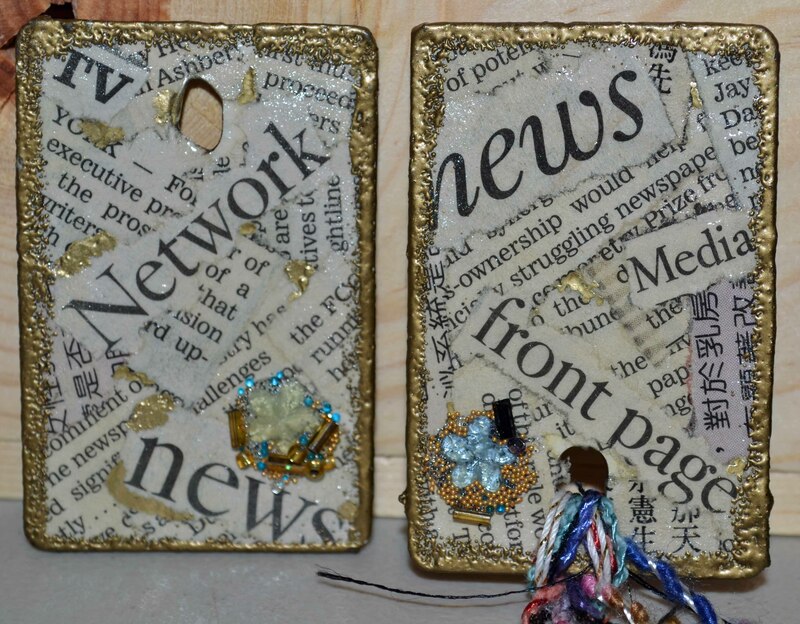 I used newspaper stories and headlines to create the background on Formica chips, sealed with Mod Podge. 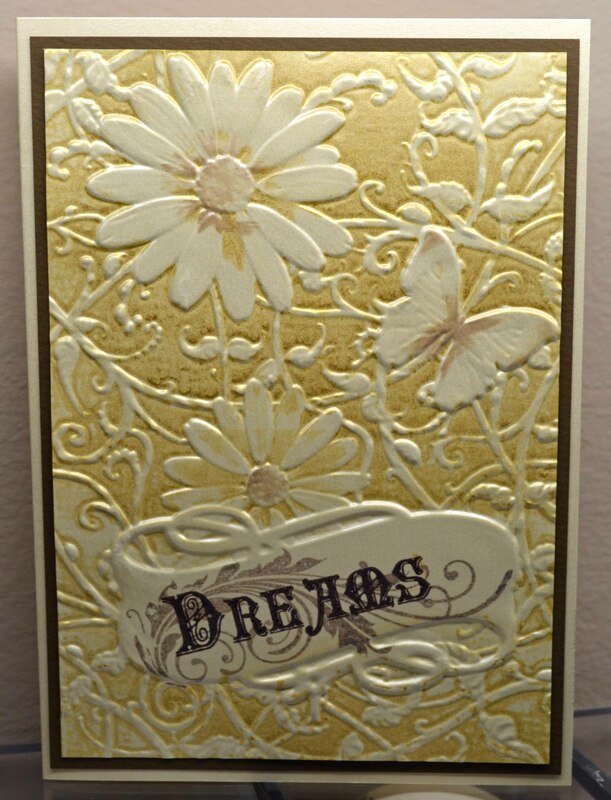 When the Mod Podge was dry I used a VersaMark pen on the edges, then added gold embossing powder. And finally, some beads and gems. Today, it’s Spellbinders’ turn to shine. If you love the embossing of Spellbinders’ double sided M-Bossabilities, you’ll be ga-ga over the deeper, more sculpted looking 3D M-Bossabilities. 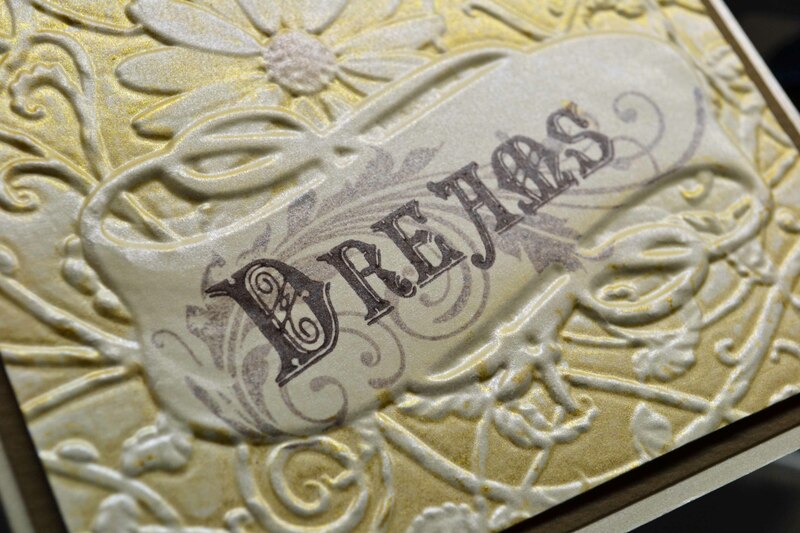 For this project, the embossing plate was inked first with gold Delicata ink from Tsukineko. 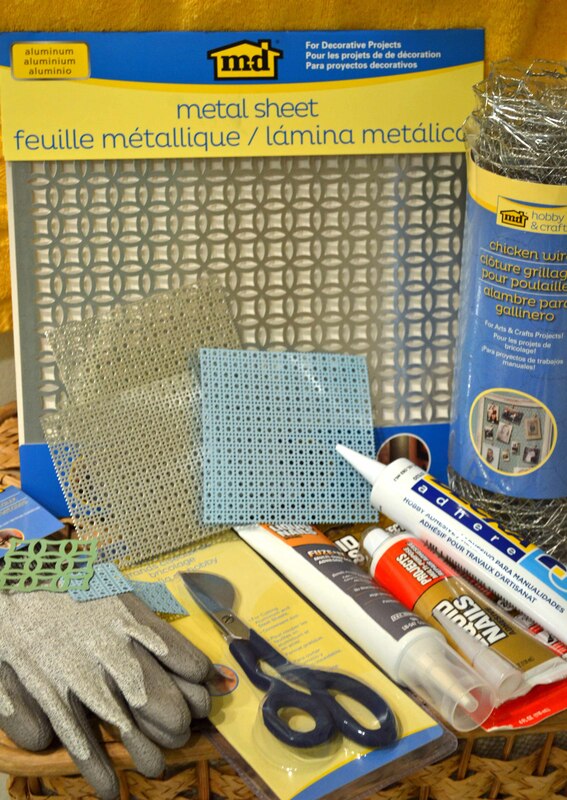 Besides bezels and blanks, there are matching templates, metals and more. The new Artisan X-plorer Machine, which I have not played with yet, is a multi-purpose high pressure machine that cuts, embosses and presses a variety of materials, including metal. 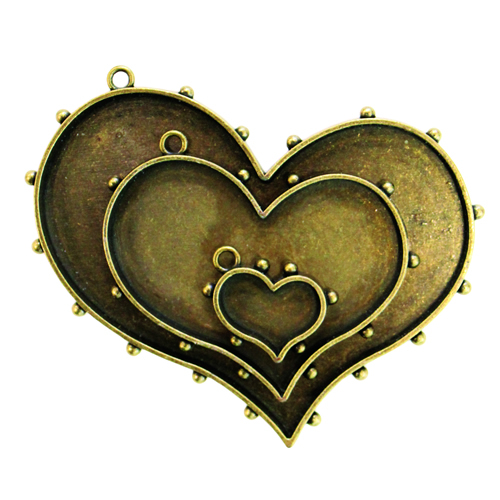 Stay tuned for more samples, examples and projects … including Valentines! Thanks for stopping by.